My last blog post was about the attempted suicide of Sarah Jane Lark of Puddingmoor, Beccles in 1914. This time I am going to tell of another suicide which occured in Beccles in 1826, this one being successful. When I first came across this newspaper transcript, I was deeply shocked because it happened at the Kings Head Hotel where I spent many childhood years roaming its corridors and exploring its rooms. "A very melancholy accident happened at Beccles, in Suffolk, on Monday morning last. On the Sunday evening a young man, of gentlemanly appearance, came walking to the Kings Head Inn, in that town, and said he should sleep there. In the morning of Monday he went to a gun-maker in the town and requested to see a brace of pistols, and took one over to the inn, he said, to show a person, but he went immediately to his bed room, and shot himself. He is not known to anyone in the town. - His dress was an olive coloured coat, drab kerseymere waistcoat and pantaloons, and a black stock around his neck; in his boot is written Mr Talevaser---Goodive, maker, of London, No. 715. Near his great coat collar is G.H. In his pocket was black letter case, with an ameythst seal, on which was engraved a dog rescuing a drowning child, and the motto, "Faithful in Adversity," and a ring. On the left side of his chin is a black mole spot." The Ipswich Journal of the 7th and 14th January 1826 reported an inquest which was held into the death of an unknown man who had shot himself. A Gentleman has been down to Beccles for inspecting the Body and property of the unfortunate young man...and has recognised him as a member of a most respectable Family in the County of Surrey, but declines to name the family. The Bury & Norwich Post of the 18th January reported: "A gentleman has been down to Beccles for the purpose of inspecting the body and the property of the unfortunate young man, who in our last week's paper is mentioned to have shot himself at the Kings Head, and has recognised him as a member of a most respected family in the county of Surrey, and has given directions for his internment, but declines to name the family to which the deceased belongs." Unfortunately I have been unable to find out more about the mysterious "G.H" and there are no further newspaper reports on the matter. It was swiftly brushed under the carpet but I have often wondered about the effects such a misfortune had upon the townsfolk and more in particular the Innkeeper of the Kings Head who, at that time, is believed to have been Mr John Mapes [source: 1823-4 Pigot's Directory]. I mentioned before about spending a lot of time as a child at the Kings Head, roaming its corridors. Much of my time was spent alone whilst my mother was working but I distinctly remember there was a bed room I did not like going into. Possessing a vivid imagination I always had a keen sense of an "otherworldly presence" but none more keenly than during my time at the Kings Head. Subsequently I have had a thirst for stories of the paranormal (from Shelley and Bronte to Dickens, Collins and M.R. James) and my interest in stories such as these and other gothic and macabre-style tales leave my mind reeling with an intense mixture of curiousity and downright fear! 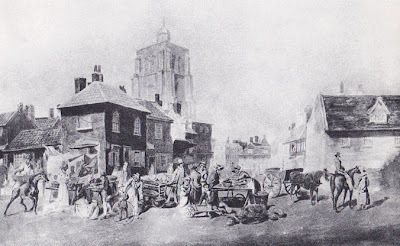 Image from E.A Goodwyn's "Beccles Past"